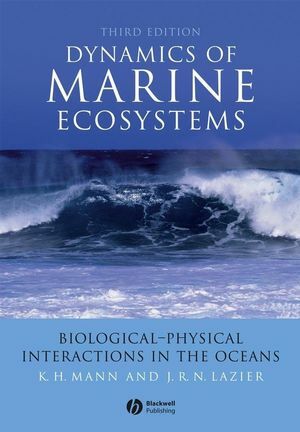 The new edition of this widely respected text provides comprehensive and up-to-date coverage of the effects of biological–physical interactions in the oceans from the microscopic to the global scale. Dr Ken Mann has taught at universities in England and in Canada and has carried out research on various aquatic ecosystems including the River Thames and the kelp beds and estuaries of eastern Canada. He is currently a Research Scientist Emeritus at the Bedford Institute of Oceanography. Dr John Lazier has been a physical oceanographer at the Bedford Institute of Oceanography since the early 1960s. His principal interest has been the circulation of the northwest Atlantic Ocean, especially the response of the Labrador Sea to decadal changes in the weather. He continues this work as a Research Scientist Emeritus. 1 Marine Ecology Comes of Age. Part A: Processes on a Scale of less than 1 Kilometer. 2 Biology and Boundary Layers. 3 Vertical Structure of the Open Ocean: Biology of the Mixed Layer. 4 Vertical Structure in Coastal Waters: Freshwater Run-off and Tidal Mixing. Part B: Processes on a Scale of 1-1000 Kilometers. 5 Vertical Structure in Coastal Waters: Coastal Upwelling Regions. 6 Fronts in Coastal Waters. 7 Tides, Tidal Mixing, and Internal Waves. Part C: Processes on a Scale of Thousands of Kilometers. 8 Ocean Basin Circulation: The Biology of Major Currents, Gyres, Rings, and Eddies. 9 Variability in Ocean Circulation: its Biological Consequences. 10 The Oceans and Global Climate Change: Physical and Biological Aspects. Part D: Discussion and Conclusions. 11 Questions for the Future. "The book is comprehensive, properly organized, thoroughly researched, thoughtfully synthesized and very well written. . . The book should be mandatory reading not just for senior undergraduate and graduate students . . . but also for those empowered to set up and implement policy for ocean governance."